That’s “fear of the ocean,” for anyone who didn’t study Greek. 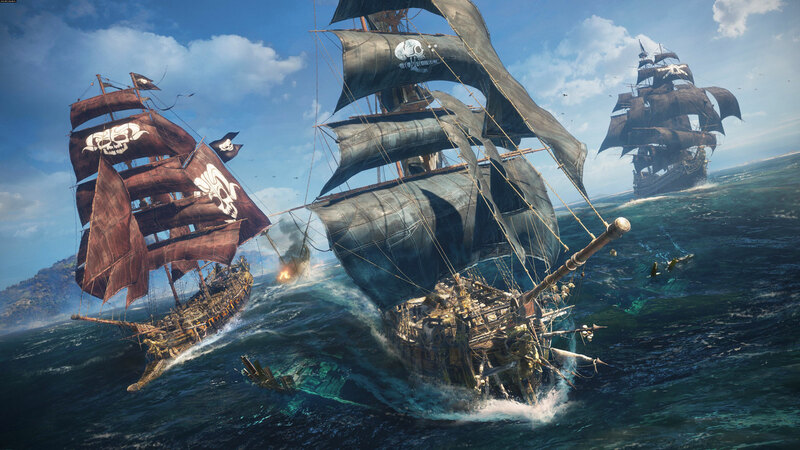 You'll have to forgive Skull and Bones for being delayed into 2019 -- it's attempting to conquer the entire Indian Ocean, after all. The latest demo for Ubisoft Singapore's seafaring adventure shows off a busy combat arena, with pirate ships roaming the waters off a pristine beach seeking battles, treasure and glory. 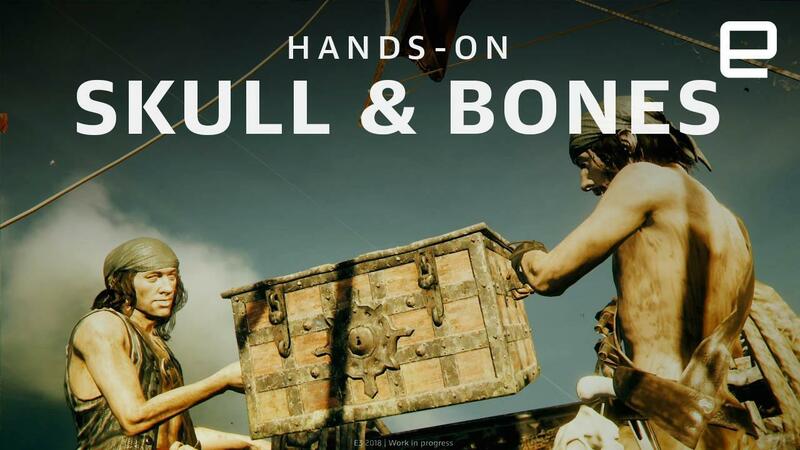 Skull and Bones is an online multiplayer-focused game, though it's playable solo, and that's exactly how I approached it at E3 2018. As a pirate captain, players are able to choose one of three ships: a tough tank type, an attacker and a longer-distance sniping vessel. I chose the tank because I wanted to survive longer than a few minutes during my first playthrough -- and I did. I even took down a few enemy vessels in the process, using a lineup of attacks specific to my ship. The tank's special move is to suddenly, quickly ram into other nearby ships. The emphasis is on "nearby" here; while this special makes the ship fly forward at a rapid clip, it has a fairly short range, making it perfect for taking down crews that stray too close for comfort. Otherwise, the tank shoots volleys of cannon balls and chain-shots (heavy orbs connected by chains), and it has a rocket-inspired weapon. I steered the ship across choppy waters, using subtle white streaks of wind blowing past my sails as a speed boost whenever possible, holding down the right trigger on the Xbox gamepad to travel faster and faster. Shooting salvos of cannon balls at enemy pirate ships, their in-game levels emblazoned above their sails, was incredibly satisfying. Glowing piles of loot lined the waters, with button prompts that appeared as I flew by, nudging me to collect chests of ammo and other goodies. I'm terrified of the ocean. I had a grand time literally shooting the breeze and starting battles with other ships, but there were also story-driven tasks to be completed in the area, such as gathering intel. 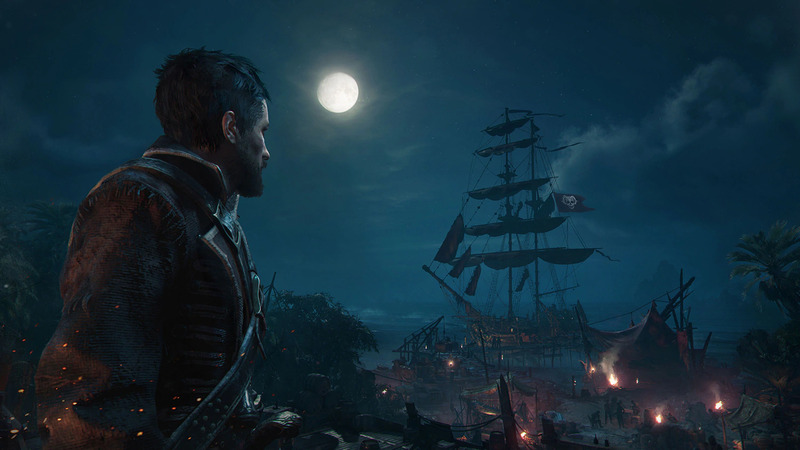 That's the overarching goal for Skull and Bones: To create a world that allows players to roam wherever they wish and engage with a more narrative experience as the mood strikes. The fact that I was so enraptured with the actual sailing and fighting is an accomplishment in and of itself -- in real life, I'm terrified of the ocean and would generally keep a game like Skull and Bones at a far distance. I never played Assassin's Creed: Black Flag, the previous game from Ubisoft Singapore, and that was partly because spending so much time on the digital water didn't appeal to me. After playing Skull and Bones, however, I'm reconsidering my decision to skip Black Flag. I did end up dying during my demo, but it was only once -- a feat that I consider a great success. The fact that I forgot my fear of the ocean is just icing on the sea-salt-encrusted cake.